Burberry has invested in taking its five year-old music platform onto Apple Music, the paid-for service which has attracted 11 million sign-ups with a three-month free trial offer. 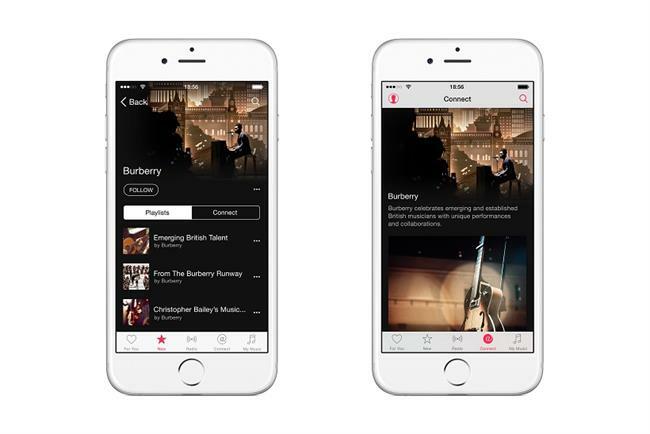 Apple Music joins YouTube, Burberry's own website and Spotify as arenas where the brand showcases its support for British artists, who have included James Bay and George Ezra. However, it is the only place where users have to pay a monthly fee to access the content. Burberry is launching the Apple Music channel with exclusive videos from emerging artists and a forthcoming performance from Alison Moyet at the Burberry Womenswear show in London on Sept. 21. The channel can be found in the "curators" section of the Apple Music service. According to Christopher Bailey, Burberry chief creative and CEO, "Music has always been intrinsic to what we do and I am excited about our partnership with Apple on this amazing platform which will enable us to take what we do now with Burberry Acoustic and share it with an even bigger audience." Burberry, which reported like-for-like sales growth of 6% for the three months to June 30, ventured into music in 2010. Since 2010, its Burberry Acoustic playlist on YouTube has notched up 98 performances and attracted 1.7 million views.